Have you ever wondered what the tiny words or numbers on your jewelry or silverware meant? If you’re not an expert in jewelry or precious metals, they may be foreign to you – often, a set of three numbers could be interpreted as anything. What does “997” on silver mean, after all? Does it mean it was pressed in 1997? Is it the individual number of the product? Is it – well, you get the point. On silver especially, these markings can be quite confusing. But the markings aren’t the only numbers that go into understanding the value of silver – what about the weights of silver? What does a “troy ounce” represent and what does it mean for the silver in my possession? If you’re looking into selling your silver to an online metal broker, this article will help you understand more about the quality and quantity of silver in your possession by helping you read the numbers and words printed onto your silver items. First, learn how to “read” silver. Check out the silver markings on your silver and silverware, gaining a better understanding for how silver is mixed as well as how much pure silver you actually possess. The Federal Trade Commission has established a specific “language” that is standard to silver printed in the United States. Look around your silver to find three digits of numbers printed out somewhere. Expect to see something like “925” or “92.5” located somewhere. 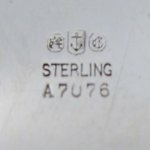 Because the actual amount of silver should be quantified on the object itself, chances are you’ll find some sort of measurement like this somewhere on your silver. What do these digits signify? They signify how much silver is present – usually in a percentage, but the three digits could be intrepreted a “parts per thousand.” For example, both” 925″ and “92.5” represent 925 parts per thousand – because 92.5% indeed is “925 parts per thousand.” If you see “.925,” this is probably also the case. So the higher this type of number is, the better, because that’s the amount of pure silver present. Silver is often mixed with other metals, especially in silverware, in order to decrease prices as well as potentially increase the strength of the piece of silver. In the example above, “925” might be printed on your silverware, but “silver sterling” or “sterling” might also simply be printed. This is significant because sterling silver, or “silver,” contains at least 92.5% pure silver in the mixture. If you have “sterling” printed on your silver, you are at least at 92.5% pure silver. Fine silver, likewise, would be printed as “99.9.” You might also see the letters “FS” signifying “fine silver.” As you know, this indicates that 999 parts per thousand is pure silver, indicating you have a high quantity and quality of silver in your possession. The troy ounce is named after Troyes, France, and the measurement goes back to the Middle Ages. It has long been a standard for measuring the amount of silver, platinum, or gold, allowing a universal pricing system that helps people trade more simply and easily. The “troy pound” is actually 12 troy ounces, which approximates to 373 grams of weight. Smaller units of weight include the pennyweight (1/20th a troy ounce), and a grain (1/480 troy ounces). If it sounds like a lot of math to you, simply remember that the troy ounce is approximately 31 grams, a very small amount of a precious metal, but a potentially valuable amount. If you’d like to use this information in order to try some strategies of determining your silver’s value, here are some strategies you could try. First, with your knowledge of troy ounces, as well as the knowledge of the purity of your silver, you can weigh your silver on an electronic scale (which should be able to tell you grams, for the conversion into troy ounces). You could try this by taking the overall weight of your silver first. Then, multiply this by the percentage of the purity of your silver (for example, 92.5 percent is .925 for multiplication purposes). 10 grams of silver alloy would yield you 9.25 grams of pure silver, giving you approximately a third of a troy ounce.